Fudge ana Expert, Author of " The Book of the Cat," and " Cats /or Pleasure and Profit"
Orange cats are sometimes called "red," but the former term gives a better idea of the colour desired in a good specimen of this handsome variety. In former days a white chin in orange cats was the rule and not the exception, but to-day it would be quite useless to pen an orange cat with this blemish. The upper and lower lip should be of the same tone of colour as the coat, and, of course, a white spot on the throat or a light or white tip to the tail is a very serious defect. There are really three varieties of orange Persians - the tabby, the self-coloured, and a specimen that is neither one nor the other, for, although the body is self-coloured, there are distinct tabby markings on the head and legs. This species has been brought into the fancy by breeders who endeavour to eliminate the markings so as to obtain a self-coloured cat. No doubt, as time goes on, breeders will bring these self orange cats to perfection. In the tabby variety, colour and markings combined are the chief considerations, but if the class is a mixed one-namely, for tabby or self-coloured - then colour should gain most points. As regards other distinctive features in this breed, it is the exception to find round heads, short noses, and small ears. As to the eyes of orange cats, it is most essential that they should be a deep golden, and if a dash of bronze is added, so much the better. It is very unusual nowadays to see a pale yellow or green-eyed orange cat. The texture of the coat in this breed should be particularly soft and silky, and is often of great length and thickness. The kittens, when born, are often dull in colour, and brighten gradually as they grow older. In the matter of mating, orange cats make a good cross with black sand tortoise-shells. A self-orange may be mated sometimes with advantage with a brown tabby that needs some brighter colouring. 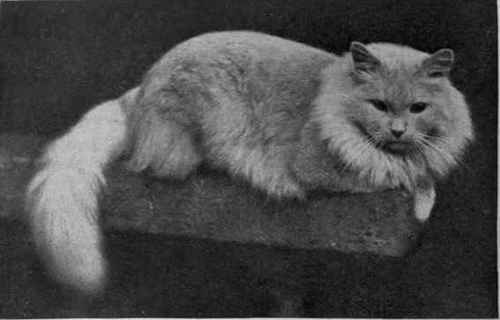 A specialist society for orange, cream, and tortoise-shell cats was founded in 1900, and although its members are few in number, yet they have proved a strong body of staunch supporters of these breeds, and have succeeded in obtaining better classification at shows and in improving the breed. With the general public orange Persians are not popular. They are disparagingly called "sandy" cats, and their pink noses are often disliked. This variety may be said to be the very latest in Persian breeds, and is one which has made rapid strides in the fancy. The term "cream" does not describe the exact colour of the cats entered under this heading at our shows, as they are almost invariably a great deal darker in tone than the richest cream in the dairy. Formerly the colour was almost fawn, but with cautious and wise discrimination in mating, the paler tone, free from tabby markings, now predominates. Good cream cats should have no blue tint in the coat, and be without any bars of darker colour on the legs or head. There must always be a certain amount of shading in cream cats - that is, the spine line will be darker, and will shade off to the sides and under the stomach and tail. Fanciers, however, should try to breed their cats as level in colour as possible. It is difficult to obtain a very pale cream that has not any white in the chest and flanks. Eyes should be a golden brown, which colour shades beautifully with the creamy coat. To secure the short head, orange eye, fine body shape, and short legs desired, it is best to mate a cream with a good cobby blue. There may be blue creams in the litter, these being a curious mixture of the two colours, quite valueless for the show-pen, but useful to breed from. It has been distinctly proved, however, that it is best to breed creams with creams for purity of colour. This breed, that was once looked upon as a freak in the fancy, is now quite a fashionable variety, and a number of cream males are placed at stud. Cream females are now fairly common, and good specimens will always command a better price than males. Kittens of this variety are not eagerly sought after, one reason being, perhaps, that, with their pale, delicate coats, they are not suitable as town pets. As with orange cats, so with creams, much has been done by the specialist society to popularise the breed, and it is not at all uncommon to read in a report of some exhibition of cats that the cream and orange classes were quite one of the features of the show.